Acropolis Museum, Athens. 460 B.C. 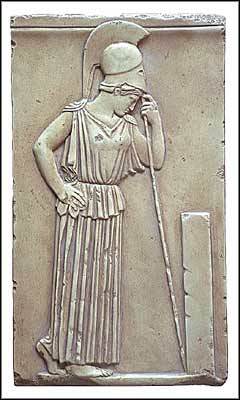 Athena was the Goddess of wisdom and women's crafts in the mythology of the Greeks. She was also a defender against evil and as such she was a warrior Goddess par excellence. She was the daughter of Zeus and Metis. When Metis became pregnant, Gaia and Uranus told Zeus that after giving birth to a daughter, she would then have a son by Zeus who would later dethrone him. On Gaia's advice, Zeus swallowed Metis. When the time came for the child to be born, Zeus was afflicted with a dreadful headache and sought the help of Hephaestus who split his skull with a bronze axe to relieve the pain. A girl in full armor sprang forth from his head: It was Athena. Athena's attributes were the spear, the helmet and the Aegis (a goat-skin shield). She attached the Gorgon's head which Perseus had given her to her shield, and this turned to stone every living thing that looked at it.